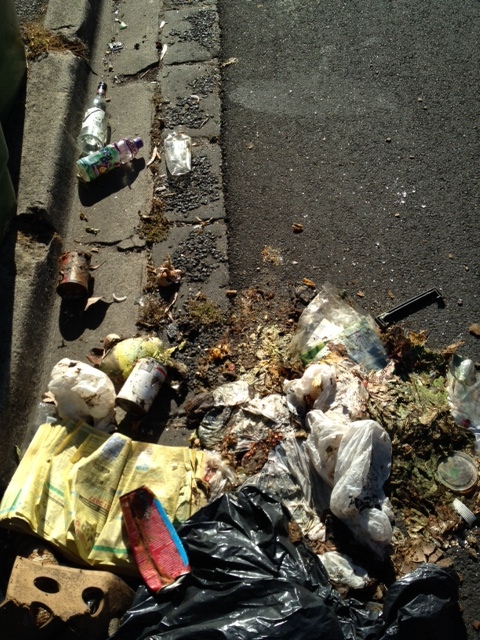 As I am walking round my neighbourhood, I am always dismayed to see so much litter everywhere. Fast food wrappers, household refuse, the odd shoe, socks or even underpants (yes, seen this very morning in a lane way); whole bags of garbage, dumped by the side of the road, remaining there sometimes for weeks. 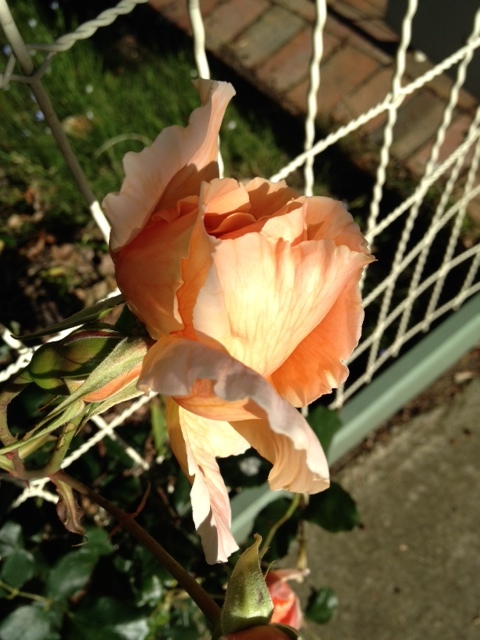 …But you might be able to bring yourself to pick this up. 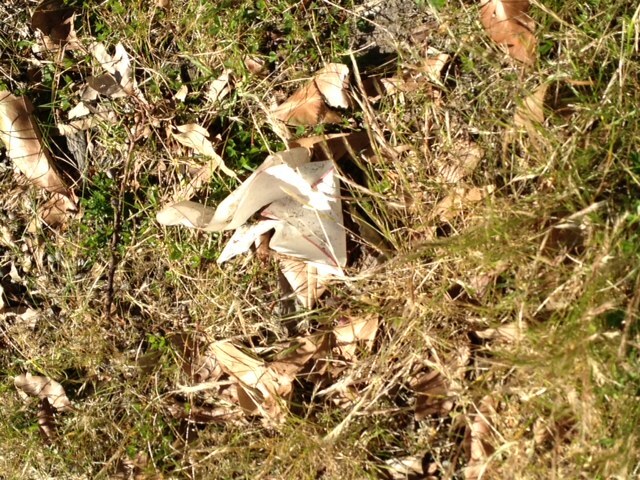 It’s a crumpled bit of paper, in among the leaves and grass. The other morning, a shopping trolley full of rubbish had been abandoned near our local train station. It was still there, days later. In public bathrooms, people scatter paper on the floor, instead of placing it in bins provided. On the trains, passengers leave drink bottles, remnants of their lunch, or worse. One day, at the university where I work, I saw a group of students sitting in a circle, where they had been eating lunch. They got up and walked away, leaving all their rubbish on the ground behind them. At the central train station, Flinders St, in the Melbourne CBD one day, I saw a child aged about four throw away the wrapper to his snack, which his mother clearly saw but did nothing about. Litter is polluting our waterways and killing marine life, making our streets dirty and hazardous, and hampering efforts to recycle as much as possible. In the 1970s and 1980s there were campaigns against littering. “Don’t be a litter bug”, I seem to remember one going. We should revive these campaigns, because people have obviously forgotten. I never litter. However, when I see litter on the street, do I pick it up? Sometimes, but usually not. It’s time for me to change. And while I’m doing that, I’d like to start a trend. Wouldn’t it be good if every one of us, no matter where we lived, picked up one piece of litter from the street each day and put it in a bin? Think how much less trash there would be in the world then. It’s something that we can do with a minimum of effort and time, it doesn’t cost us any money, and collectively, we’d be doing the world a favour. This is one of the rules I would make for the world if I could. This is my humble dream to promote peace. In a clean world, you can see and think more clearly, so a cleaner world is a more peaceful world. I really believe that, which is why I have written this post for Kozo’s October B4Peace challenge at Everyday Gurus, which you can read about here. Another post I really liked this month, for its simplicity and honesty, was Claudia’s, in which she implores people just to be kind to one another. You can read her post here. 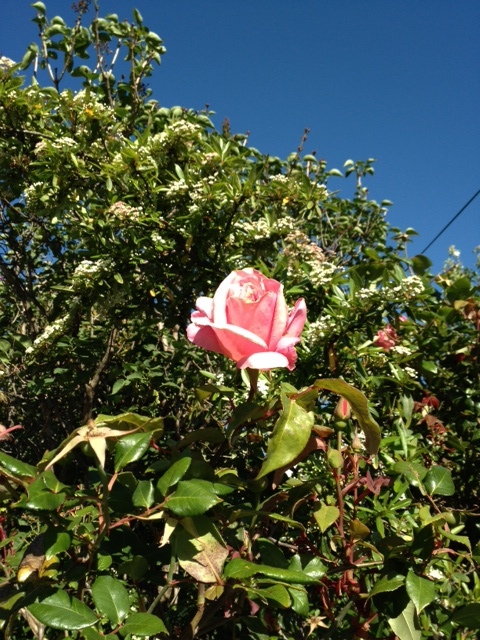 …and this one, a bit too high to smell, but adding its beauty to the street where I live.